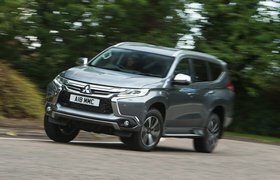 Promoted | Mitsubishi Shogun Sport: From Lake To Peak | What Car? In November, we took three heroes from Mitsubishi’s diverse range of rugged and capable SUVs to the heart of the Lake District, following two extreme triathletes on a gruelling training session from Ullswater lake to Kirkstone peak. It’s time to take a closer look at one of the stars of that story – the Mitsubishi Shogun Sport. From its head-turning design and solidly engineered off-road underpinnings, to its technology-packed seven-seat interior, the Mitsubishi Shogun Sport has been designed to let you conquer tough terrain with ease, without compromising comfort or long-distance refinement. Don’t be fooled by that stylish exterior, with its LED headlights and custom-matched 18” alloy wheels. The Shogun Sport is a true outdoor adventurer, honed by Mitsubishi’s decades of off-road experience. Simple-to-use Super Select II four-wheel-drive lets you pick the best blend of grip and performance for the conditions, making the most of the 181PS and 430Nm of torque from the powerful all-aluminium 2.4-litre turbo diesel engine. Lockable centre and rear differentials and a low-range gearbox – allied to safety features such as Hill Start Assist and Hill Descent Control – give you an extra degree of confidence in tricky conditions. With a 218mm-high ground clearance and a 700m wading depth, the Shogun Sport is perfect for fording streams or tackling rocky roads, while a 2,800mm wheelbase, a 30-degree approach angle, a 24.2-departure angle, a 23.1-degree breakover, and 45-degree lateral travel mean it’s got all the angles that matter for steep terrain. Plus, it’s capable of towing up to 3,100kg, with a Trailer Stability Assist feature that detects ‘trailer swing’ and compensates by controlling wheel slip. The Shogun Sport hasn’t just been designed for the rough stuff. It’s equally comfortable tackling long road trips from town to country. Its 2.4-litre turbo diesel has been mated with an all-new 8-speed automatic transmission with column-mounted shift paddles for seamlessly smooth power delivery. Keyless entry, an electronic parking brake, electric power-folding mirrors and automatic headlights and rain sensors take the pressure off the driver from the start, while advanced safety systems – including Adaptive Cruise Control, Forward Collision Mitigation and Blind Spot Warning on the Shogun Sport 4 trim – keep you and your passengers safer. Up front, the driver and front passenger benefit from stylish leather seats with power adjustment, as well as dual-zone climate control and electric windows, with heated front seats on the Shogun Sport 4. The six-speaker Smartphone Link Display Audio has plenty of options to keep everyone entertained, with DAB radio, Bluetooth, USB and HDMI connectivity, while Apple CarPlay and Android Auto let you use dedicated apps for navigation, music, calls and messages using the touchscreen or voice control*. There’s also an upgraded eight-speaker audio system on the Shogun Sport 4, with a 510W amplifier for even greater acoustic performance. And Mitsubishi hasn’t forgotten the people in the back, with rear electric windows, privacy glass and overhead air vents with a central control panel. The Shogun Sport is equally competent navigating urban environments. A reversing camera and rear parking sensors are fitted as standard, while the Shogun Sport 4 trim adds a 360-degree camera, front parking sensors and Ultrasonic Mis-acceleration Mitigation – which prevents accidental application of the throttle at the slow speeds of stop-start traffic and parking. The seven-seat interior is incredibly flexible, with up to 1,488-litres (VDA) of load volume with the rear seats folded down, and up to 1,687mm load length. With a one-piece tailgate, an easy-to-load floor height of just 840mm, 880mm of load height and up to 1,280mm of load width (with 1,000mm between the wheel arches), it’s perfect for carrying large and long loads. 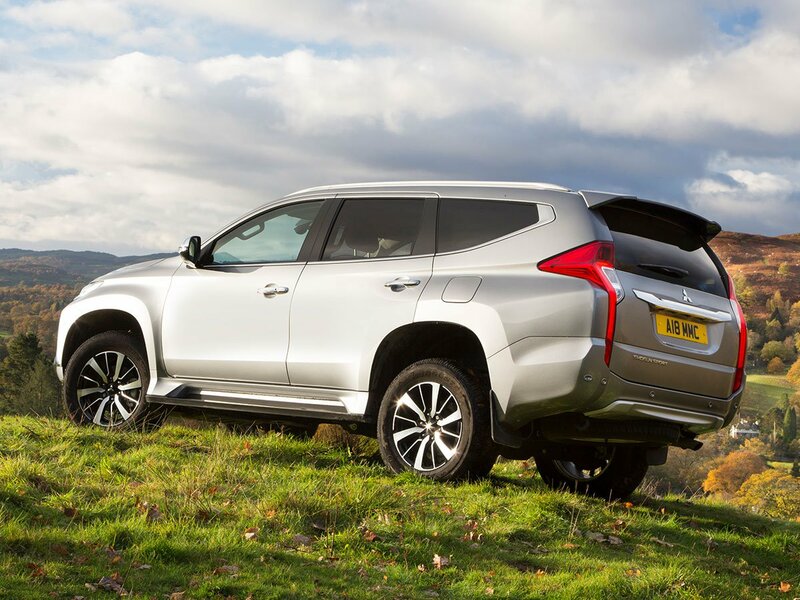 So, whether you’re conquering the great outdoors or your local supermarket, the Shogun Sport is easily capable of delivering where it counts. Shogun Sport fuel consumption in mpg (ltrs/100km): Urban 27.2 (10.4), Extra Urban 37.2 (7.6), Combined 32.8 (8.6), CO2 emissions 227 g/km. Fuel figures shown are official EU test figures, to be used as a guide for comparative purposes and may not reflect real driving results. * Please note: Mitsubishi cannot guarantee compatibility with all mobile phones and Bluetooth devices with the hands-free system fitted to this vehicle. Please check with the mobile phone manufacturer for further information on compatibility.